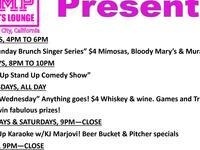 Join AMP Sports Lounge for our weekly stand up comedy show! All new talent every week! It's only $5 and a 1 drink minimum.